AVIDAC, Argonne’s first digital computer, began operation in January 1953. Pictured is pioneer Argonne computer scientist Jean F. Hall. M. Butler and D. Greenwood: Photo shows CDC-3600 Computer console and magnetic tape units. Computer user and computer operator discuss special computational problems. Under certain conditions, information may be inserted directly into control unit registers by use of the console keyboards. Richard Aschenbrenner, Associate Computer Engineer, one of two designers responsible for the overall design of the system; Jack Bowers, Technical Assistant; and Forrest Salter, Associate Computer Engineer who was responsible for the circuit design and construction of the FLIP computer. Arithmetic unit (right) and memory unit (left) for GEORGE, a high-speed electronic computer built by Argonne from 1955-1957 to replace its previous computer AVIDAC. Two Argonne scientists work on a 1950s era computer. View of CDC-3600, high-speed digital computer manufactured by Control Data Corporation. Rusty Lusk (left), Scientific Director of the Advanced Computing Research Facility, and Hans Kaper, Director of the Mathematics and Computing Science Division, in the Advanced Computing Research Facility. This shows Jazz, the Laboratory Computing Resource Center’s 350-node computing cluster for the laboratory community. David P. Weber, Director of Argonne’s Computing and Telecommunications Division (1986-1994), with Argonne’s Cray X-MP computer, a shared-memory parallel vector processor. The Cray X-MP was the world’s fastest computer between 1983-1985. SP1, the world’s largest parallel processing supercomputer. Installed at Argonne in 1993. From Left: John Rowlan, Carolyn Cox, Fred Moszur, and Fred Dech, Computing and Telecommunications Division, in the Scientific Visualization Facility. 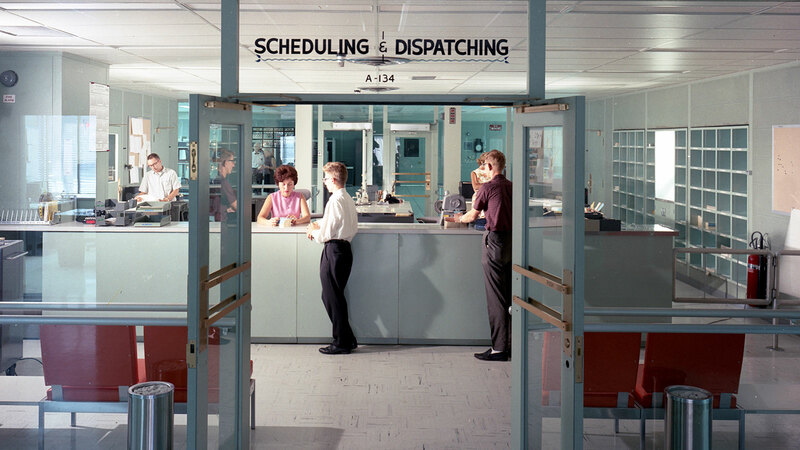 This shows the Scheduling & Dispatching Center for Argonne’s computers in 1965. Researchers from many fields used the IBM Blue Gene/P supercomputer at the Argonne Leadership Computing Facility. Theta, a next-generation Cray/Intel system, will help bridge the gap between Mira and our ALCF-3 machine Aurora. When Aurora goes into production, this supercomputer will be open to all scientific users – drawing America’s top researchers to ANL. Theta’s massively parallel, many-core architecture puts the ALCF on the path to Aurora, the facility’s future Intel-Cray system.